our 2019 Farm Champion csa is full! Thanks so much for your interest, sorry you missed our sign up window! You can click the button below to sign up for our wait list in case a share becomes available. We hope to see you at the McMinnville Farmers Market this year! The Farm Champion share consists of 22 weeks of vegetables AND 8 weeks of summer bouquets. The Vegetable share will contain approximately 7-10 different vegetables each week. This share size allows us to showcase the bounty & variety of our vegetable fields without overwhelming you with too many veggies. The share should comfortably feed 1-2 adults and up to 2 kids for one week. If you have a larger family or really go through the veggies, consider buying two shares to ensure you meet your veggie needs! The Summer Bouquet share will consist of 8 weeks of beautiful mixed bouquets designed by Farmer Beth. 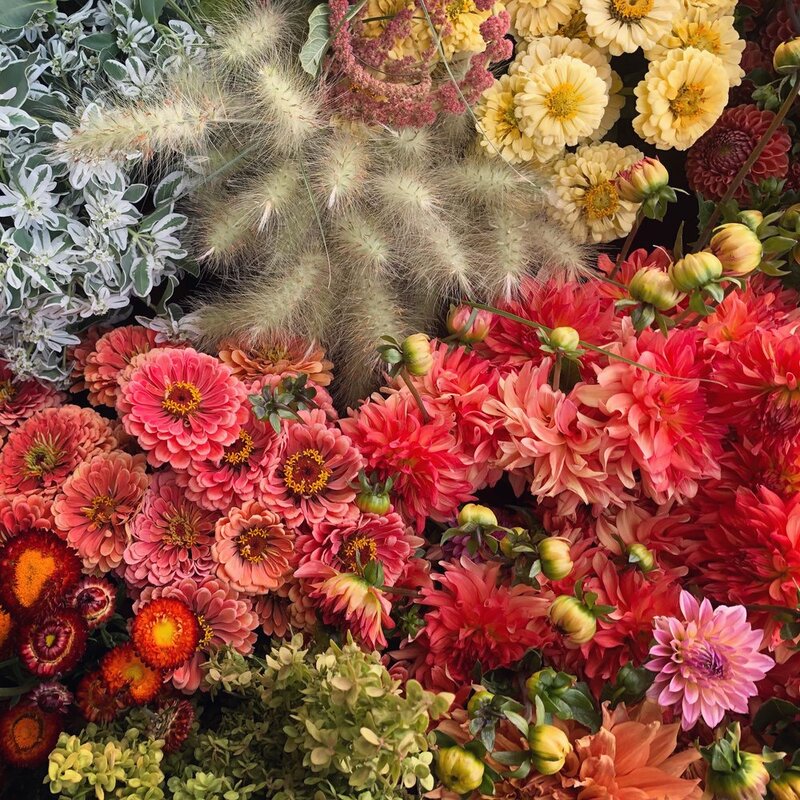 A longtime customer favorite, this share features the absolute best of the summer flower patch, including blooms like sunflowers, snapdragons, lilies, zinnias, marigolds, asters, and so much more. Unique color combinations, textures, and scents abound. Celebrate the light and heat of summer with weekly bouquets, arranged with love. A note on splitting shares. We do allow members to split a share. However: your farmers do not facilitate the splitting of shares or coordinate payment among individuals who are splitting a share. If you would like to split a share, you are solely responsible for coordinating all payment and pick up details with the second individual. If you are planning on splitting your share, please be sure to carefully review the guidelines laid out in our CSA Terms & Conditions. Even Pull Farm is not responsible for any missed pick ups or payments due to the splitting of a share. If you are splitting a share, be sure to note that on your sign up form & include the email of the second individual so they can receive the email newsletter. Thank you! Please be sure you read & fully understand the agreement laid out in the CSA Terms & Conditions before you sign up for a share or submit payment. If you have questions about the CSA, please read all of the information given on the share page and check out our FAQ page. If you have further questions, you can contact us via email at evenpullfarm@gmail.com. CSA Pick Up will be held weekly on Tuesday evenings between 4:30 & 6pm at Flag & Wire Coffee in the Granary District in McMinnville. *PLEASE NOTE The actual start date may vary depending on weather and availability of crops—members will be informed of official start date with at least 7-10 days notice. Vegetable Share: Projected start date is May 28th. Pick up will run for 24 weeks, including 2 built in vacation weeks. Summer Bouquet Share: Projected start date is July 9th. Pick up will run for 8 weeks. This share is scheduled between the two set vacation weeks and will not be affected by them. In our 2019 season there will be two set CSA-wide vacation weeks on July 2nd (the week of July 4th) and September 3rd (the week of Labor Day). In our experience over the past few years, these are the most common weeks of the year for members to be out of town or to miss a pick up. You are not charged for these weeks, and we will not hold pick up on these days. In 2019 we will no longer be offering a “floating” vacation week. If you are leaving town and will miss pick up on a day that isn’t one of the CSA-wide vacation dates, we ask that you please send a friend, neighbor, or family member to pick up your share for you. PLEASE NOTE: Your spot in the CSA is only held once we have received payment. In 2019 we are taking online payments only. When you submit your membership form you will be directed to our online store where you can make your payment. Please do not mail a check. Thank you! A $475 DEPOSIT secures your spot in the CSA and is due when you sign up. After you sign your membership agreement you will be automatically redirected to our online store where you can pay your deposit. The $300 BALANCE is due by May 1st. After you sign up & pay your deposit, we will email you a direct link to pay the balance on your share whenever is convenient for you. If we do not receive your final payment by May 1st you may lose your spot in the CSA.